Bertha Jeffery Responds To Criticisms of Cortes Islands legal petition. The article that follows consists of personal opinion and is not necessarily the opinion of Cortes Radio, its board, employees or volunteers. On January 2, 2019, fourteen Cortes residents filed a legal petition, in the Supreme Court of British Columbia, stating that Regional Director “Anderson took money from her constituents for personal gain and a number of these same constituents received gifts and grants in return.” Many of the twelve individuals and seven non-profit organizations named in this document felt it was an attack on their integrity. Approximately half of the island’s adult population signed an open letter protesting the petition and the SRD’s failure to support their Director. In a recent Facebook exchange one of the better known petitioners said they have been misrepresented. Bertha Jeffery responds to criticisms of the legal petition. “The allegations are against Noba as an elected individual accepting funds from her constituents without disclosing them. No reverence [reference] was ever made that these people were trying to bribe her … if we thought this was bribery we would have brought charges against the constituents. We did not, nor do we intend to,” Jeffery wrote on the Cortes Radio Facebook Page. Jeffery did not explain what the named Cortes constituents allegedly “received gifts and grants in return” for. Or whether she thinks they expected said gifts and grants prior to making their donations. They each gave between $20 and $100 to a GoFundMe campaign set up after Bernie Anderson’s cabin burned down on January 31, 2018. Bertha Jeffery is the anonymous petitioner mentioned in 5:30 – 5:48 of the podcast of the podcast above, which was broadcast over Cortes radio on January 23, 2019. Jeffery was in Victoria when she returned my phone call. She declined the opportunity to be interviewed and added that she doubted that any of the other petitioners want to be interviewed. Jeffries said they had been receiving a lot of flack since the Campbell River Mirror broke this story, naming all of the petitioners, on January 7, 2019. Anderson’s neighbour and land-partner Lovena Harvey set up the GoFundMe campaign called “Bernie’s Cabin Fire Rebuild” on March 13, 2018. Twenty-eight people, many of which were Cortes residents, subsequently donated $3,700. Almost all of these were made “11 months ago” or “12 months ago,” which is about March or April, 2018. Another Cortes donation, for $25, was made “9 months ago” (about June, 2018). The donations from Cortes residents are of amounts between $20 and $150. The largest of the donations from named individuals donations are for $100. The petitioners claim that Noba Anderson, who is her father’s legal guardian, was in a conflict of interest when she accepted those funds and used them to built an addition onto her home for him. “What The Lawsuit Is About,” Or Not? “She should have declared the income especially when asked by the SRD and did the honourable thing and returned the funds. And take down the Go Fund Me page. She refused to and that is what the lawsuit is about,” claims Jeffery. Jeffrey did not say when she and the other petitioners started talking about making a legal attack on Director Anderson. Did they come up with the idea after the October 2018 election? Or before? When did they first approach a lawyer? Were all fourteen petitioners involved in the final decision? Was everyone who signed that document aware it was the beginning of a lawsuit in the Supreme Court of British Columbia? “Why did Noba hire a lawyer in late 2018? The law suit was filed in January. Obviously she knew she was in legal trouble,” says Jeffrey. I emailed the Strathcona Regional District for clarification about some of Jeffrey’s remarks, but expect the SRD to, once again, say they cannot comment on a matter before the courts. In the Community Charter, it says (item 105) “(1)A council member must not, directly or indirectly, accept a fee, gift or personal benefit that is connected with the member’s performance of the duties of office. Jeffery did not think it significant that Director Anderson appears to have been acting in her father’s interest when she added a bedroom for him to her home. Noba Anderson is her father’s legal guardian. Nor has Jeffery explained her personal motivations for suing her Regional Director. Nine of the twelve named individuals filed affidavits, and in almost every case point to significant errors of fact. You can read my synopsis of these documents, and find links to the affidavits, here. As a consequence of the Legal Petition, the Strathcona Regional District has delayed a number of matters pertaining to Cortes Island. The proposed referenda for First Responder funding and a Community Hall Service tax have been delayed several months. 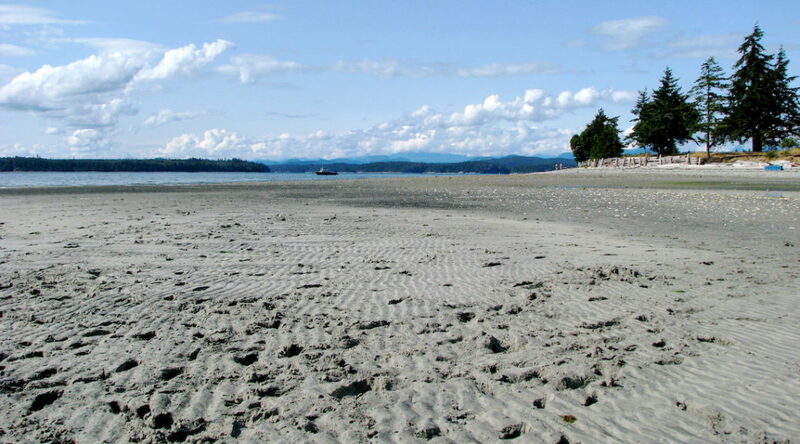 Cortes Island still does not have an Advisory Planning Commission, whose membership would have otherwise have been confirmed at the January 24, 2019 SRD meeting. The fate of a $5,000 grant in aid application, which the Klahoose Nation filed to help fund the employment of “a researcher to catalogue information on artefacts, burial sites, and culturally significant sites currently held in government records” has yet to be determined. This is not the only known incident in which anonymous Cortes residents have attempted to shape developments on the island. 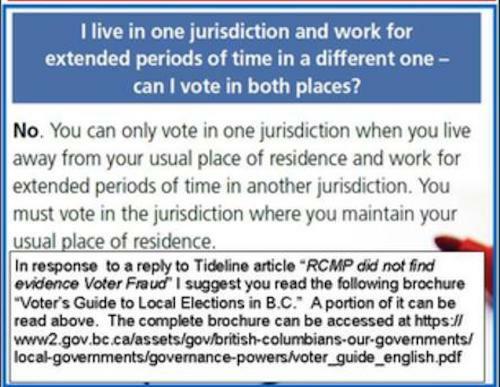 Shortly after Director Anderson was re-elected the RCMP received complaints that 43 voters did not qualify as residents of Cortes Island. The RCMP investigated, but found no evidence to substantiate these claims. While it is not known if Jeffery has any connection to the anonymous informant(s), she published an anonymous post defending their actions in the March 15, 2019 Cortes Marketer. This article revealed new information. It appears the allegedly fraudulent voters may have been accused of having their “usual place of residence” in another jurisdiction. We read with great interest the recent comments made by Bertha Jefferys with regards to the January petition filed with the Supreme Court of BC. Of particular interest were the comments that there was no intention to malign the names of those mentioned as somehow contributors to some bribery scheme with our current Regional Director. So Bertha, and other signatories of that petition, please let us explain to you what your “accidental” and “unintended” “non-accusations” have had on some of our lives. At the very least, your document feeds the rumour mill, sapping the time and energy of people who contribute to the benefit of this community. Elements that you, the other petitioners and your background supporters all-knowing or unknowingly benefit from. You have entered your unfounded hunches into the court of public opinion, a forum the feeds on speculation and innuendo, not facts or fairness. Since the petition made its original rounds, we have found ourselves having to explain ourselves, justify our finances and defend our motives. The conversation is like a Möbius strip, going around and around with no end. If we were not already three years into the Strathcona Regional Districts Emergency Communications Program, I’m not sure it would have survived. We have gone from a small handful of volunteers to somewhere in excess of 40. The impact of this petition has pretty much sapped us of what energy we had left. It will stand on its own now, but two years ago this petition would have killed our enthusiasm and, subsequently, killed a program that will help provide resources to Cortes Island in the event of a disaster. There has been a huge cost to us in our energy to volunteer in the many other roles we are involved in – who would want to donate time, money and efforts to such an ungrateful group? We have been asked to organize another Emergency Preparedness Fair. Bertha and company, please explain to us why we would? Will we be accused of somehow embezzling community funds? Especially if our Regional Director participates? The recent accident taking the life of a young boy has resulted in another GoFundMe campaign. Although our hearts go out to the family, we’re understandably reluctant to contribute per chance that some other disgruntled islander will see fit to turn this kind effort to their personal and political advantage. Barry and I are exhausted. Although the petition is fraught with errors and we know it is an attack on our current Regional Director, it has cost us personally. Stress is evil. It attacks the heart, the soul, the body and the mind. Both Barry and I have been impacted by the insidious nature of this disease since February. We are grateful to the Cortes Island community who have called out to us, supported us, and been kind. We remain still stunned that a handful of selfish individuals can have such a huge impact on our well-being. But this is what happens on Cortes when you stick your neck out to try to make a better place to live. When we came to Cortes, we were looking for a quiet community that we could enjoy, support and contribute to. For Barry, the stress and rigours of cancer research and spearheading the Vancouver Island Cancer clinic had taken its toll on his health, but nothing prepared us for this kind of stupidity. During our research, we had never experienced a cancer as aggressive and insidious as this one.